Here’s my latest build. It’s ridable but not quite finished. 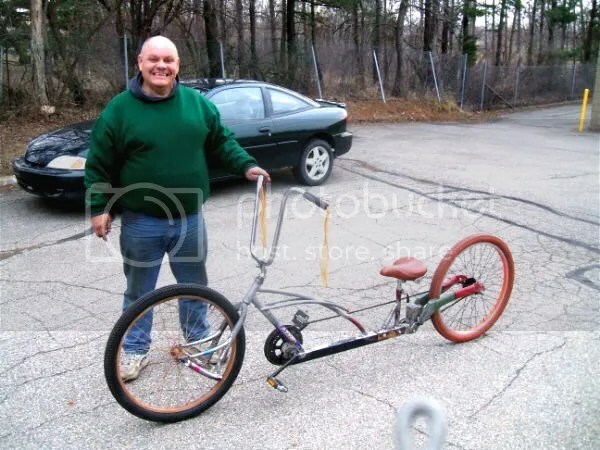 The tour De Hell bike gave me the initial inspiration for my forks. I just had to be a little different. This bike also fits the theme of this thread as it is made up solely from parts left over, bikes that were given to me, old bike projects that I just didn’t want anymore and the bike that injured my wife last Thanksgiving! Also, some treadmill frame parts, Exmark walkbehind commercial mower parts and probably some other junk that I forgot about. The seat was a gift from Gigs a few years back and everything else was free. The only expenses I have into this bike is welding wire and eventually primer and paint. The bike is fast and coasts for ever! The steering is quick and precise. At least ten different people have ridden the bike and everyone has had good comments about it. I made the seat area to slide forward or backwards plus the seat raises or lowers. 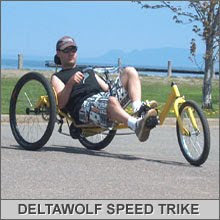 This allows for most anyone to ride the bike comfortably. The bike has probably over 130 miles on it as it sits. Eventually, I’ll have the 7 speed cluster hooked up and shiftable, along with brakes. The bike will be in the Bike 4 Betty (www.bike4betty.com) ride in Ontario the end of this month. I will be representing the FreakBike Militia – Great Lakes chapter along with Gigs, Scrappy Ron, B.G. Customs and others. We will also be riding with the FreakBike Militia -Golden Horsehoe chapter and it’s members, YYZMEC (Tony), Dustin, Jody, Phat Freak, Bad Press and others. We will ALL be riding FreakBikes alongside the roadies and mountain bikers who make the large numbers in the group. We’re riding 30K. So if anyone is interested in coming out and joining us …… Then come out and join us! Didn’t mean to steal this thread but the bike fits on several levels and also shows how I like to put my hobby and my charities together. We have compiled a Frequently Asked Questions section on the main AtomicZombie.com web site. 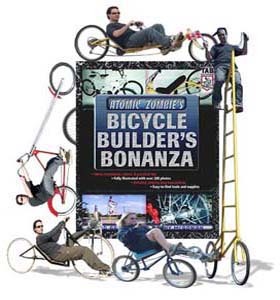 We occasionally get specific questions about Atomic Zombie DIY plans, so rather than repeating the same answers over and over again, we will blog about some common questions and answers.